Could you be giving off signs every time friends come over to visit that you are intact a blogger? Do you suspect your buddy of leading a separate double blogging life online that they haven’t told you about? Trying to stop your mum from finding out your blogs Instagram name? Here’s a few tell tale signs that you have crossed the threshold and stepped into a home that only a blogger could live in. It’s not that they’re boring, minimalist or uninterested in home interior, it’s just everything looks better on a white background and nothing screams editorial pictures like bright and crispy lighting which only an all white room can give. Every light bulb in the house is white and you need sunglasses to go the toilet it’s so blinding in there - but if you ever saw the pictures, you’d understand! Wallpaper collecting and tile hoarding. There’s a random roll of wood effect flooring wallpaper hiding behind the couch - and there’s no room in the house decorated with it. There're more wallpaper samples than you can shake a paste brush at, most of which are perfectly square and there will be hell to pay if you fold a crease down the middle of one. Then they're the tiles. From the bathroom to slate, patio and marble effect, random tiles stored in the cupboard, more than likely wrapped in a piece of burlap and covered in white tack residue (those bottles don’t face forward on their own you know!). And no, your friend hasn’t taken up a tilers course when she says she’s busy on the weekend, she's cramming in as many daylight picture taking hours as she can. Tape marks on the floor. You know that moment when you set your tripod up just right, the lighting hits you perfectly, you haven’t cut your own head out of the shot and your backdrop is both simple and interesting without drawing too much attention away from your latest OOTD. Fear of being mere millimetres off next time could cost you likes and followers - so you tape mark the floor. It’s just a little slither of tape…nobody will ever notice…right? There’s never a hot meal. Even if you order a takeaway, the food is placed just so on the coffee table, with odd knickknacks and candles in the spaces. Photos of spoons in sauces and a hand reaching for the salt are taken without question and if there're any excess sauce splatters around the edge of the plate, you can be sure they’ll be wiped off before pictures from at least 3 different angles are taken. You’ll find the microwave is always available if you ever want to eat a hot meal in this house! One random corner of a room will be so clean, not a cushion out of place, a throw perfectly folded hotel style across the back, a living brightly coloured plant and the latest empowerment book casually strewn but artistically placed at the foot of the chair. There’s probably a brew and a pink macaroon for good measure too. The rest of the room looks like several two-year-olds have had too much sugar and gone wild from floor to ceiling. Nail polish stains, burnt out candles, last nights take away, light boxes, PR samples, and the blood, sweat and tear stains that went into creating that clean zone and taking the 100 pictures of it just to show how you’ve spent a relaxing Sunday, chilling in your book nook - not. The cat keeps trying to clad the throw and the macaroon might be bright but it’s gone stale and the brew is cold. Sound like any-bloggy you know? My whole room screams blogger. Lights, camera.. awkward! Lights, camera...awkward! I friggin love this! I will be using this haha. How handy is the wallpaper! I'm full on hoarding all different samples to use as backdrops hehe! Oh I do love a homey home, but I think a fair few of us have those moments when we blitz clean just one tiny section to make it more Pinterest worthy haha! Oh I know! Roll on the daylight! There's only so far lightbulbs and editing can get me haha! Hahaha so true. Although I hadn't thought of using tape to mark out a tripod - will be trying this out! Works a treat! Saves so much time the next time you come to take some photos if you can't leave your tripod permanently set up! I am slowly bringing in the daylight bulbs, I'm really hoping Mr doesn't notice. We have awful yellow halogen bulbs all over the house and it drives me mad! You are certainly NOT alone!! We're all in this madness together that's for sure! Interesting read - luckily i'm not there yet! Ohh give it time, you will be haha! Laughing my head off at this post, it's so very true! Haha thanks! Glad you enjoyed it! Scary how true it is! Haha but as long as we can take our pictures who needs to watch the tv? Hehe priorities! I don't have a 'clean zone' yet as I just started, but I can feel one coming! Oh the clean zone is a must for picture taking haha! 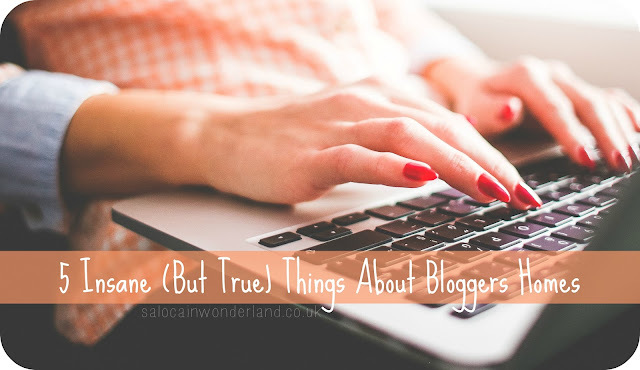 All these things come to all bloggers in time you can be sure of that! You're clearly good at keeping your blogging a secret then haha, it's amazing how so many blog spaces look very similar! Haha if you clean that one corner you certainly are a fully fledged blogger! As soon as you start you will hoard so many wallpaper samples I can assure you! Thanks so much! I'm guessing you noticed a few of these around your own home? hehe, we can't help it, blogging just spills over into everything we do, even interior design! You are certainly NOT the only one! It's almost like a full on bloggers starter gift pack!